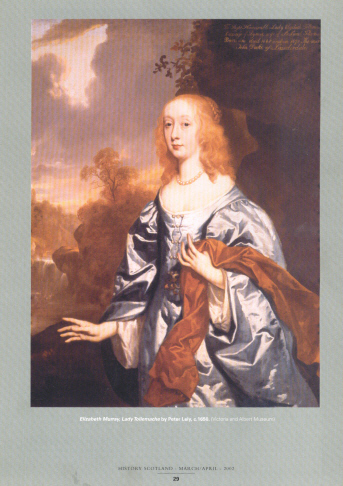 Elizabeth Murray born in 1626 daughter of the first Earl of Dysart was probably the most powerful and influential woman in 17th. century Scotland, by all accounts something of a femme fatale, oft painted by Society artists, renowned for her wit and beauty yet at times ruthless and unscrupulous and finishing up loathed and detested. Her life spans the tumultuous years of the Civil War, the Commonwealth and the Restoration. There is no doubt she was on friendly terms with Cromwell and there were even wild allegations of impropriety with the Lord Protector himself. She was though undoubtedly a secret Royalist, and a member of the Sealed Knot Society an underground movement which plotted to restore the monarchy. She married Sir Lionel Tollecache a Suffolk landowner in 1647. He didn't however enjoy the best of health and died in somewhat suspicious circumstances in 1669 and there was even talk that his wife was reposonsible for his demise having had him poisoned. Together they spent lavishly on their various properties in Scotland but particularly at Thirlestane which beacame one of the finest baroque houses in the country albeit it was paid for out of Treasury not personal funds. The Duchess was known to take huge bribes and indeed at one point impeachment proceedings were raised against her by the Town Council of Edinburgh. A most interesting talk on a fascinating lady.